The 24 hour period before the exact New Moon is perfect for a "New Moon Fire Ritual." This unusual astrological alignment1 suggests that through an Arian Fire Ceremony (New Moon in Aries) we can release ourselves from obsolete values and attitudes that may be delaying our transition into a more progressive or spiritual awareness. What the element of Fire represents is the ability to transform something of our past that is obsolete into something that has new meaning and significance, so it can be carried forward. What is carried forward is imprinted and activated by Source Energy and given new light and illumination by the same elemental Fire. In this way the past is literally given new meaning, through this illumination of a new creative impulse. 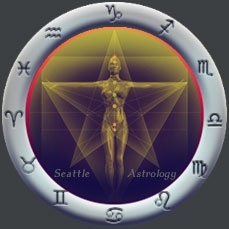 The Seattle area has an astrological signature which amplifies the potential to release the past. Areas of our life will become amplified in circumstances that don't seem to be working as well as they did in the past. This is allowing for the potential readjustment of our entire lifestyle, if we can recognize the shift necessary to anchor a bigger change. A Fire Ceremony can be used with great effectiveness at this time. Objects that represent the obsolete past can be released with the element of Fire. This process engages our mind and our feeling/intuitive side with the power to "let go" of the past that is hindering us. As we "let go" of the past we are free to embrace a "new way" of thinking or acting that isn't conditioned by the attitudes and generalizations we have taken on from family and culture. There is the opportunity to let go of any of those things that just plain don't work anymore. This New Moon ties in very nicely with Mercury going retrograde earlier this week. Look for my upcoming article that uncovers "The Mysteries of Mercury Retrograde." This is an astrological phenomenon that has baffled astrologers for centuries. Be prepared for a unique perspective as I take an Esoteric look into the mysteries of Mercury Retrograde. Footnote: (1)The exact New Moon is Sunday, April 3rd, 7:32 AM, occurring at 14° Aries. The Moon is conjunct the Sun, Mercury, and Jupiter; square Pluto; and opposed Saturn.